Putting Jesus in His Place, Robert M. Bowman Jr. and J. Ed Komoszenwski, Kregal, 2007. When it comes to books written on Christology and in particular the deity of Christ, there tends to be two categories. The first, a rather dry and stodgy academic affair wherein the author(s) seek to make their mark and argue for or against biblical orthodoxy. The second is that work in which the author is quite passionate about the subject, and even may have some insights, but in the final analysis doesn't really deliver the goods. What category does Putting Jesus in His Place fall into? Neither. Bowman and Komoszewski have created a category all their own. 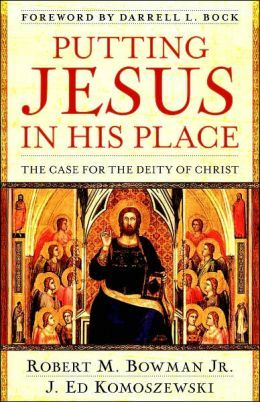 Bowman and Komoszewski have provided a work which not only aptly demonstrates the case for Christ's deity, but they have done so in a book that is eminently readable, enjoyable, memorable, and scholarly at the same time! It begins by introducing a keen acronym that serves to enable "people of different backgrounds to remember and explain the biblical evidence for identifying Jesus as God." The acronym "HANDS" identifies that Jesus shares the honors, attributes, names, deeds, and seat of God. This acronym serves as an outline to the book, which also includes a Recommended Resource page and a Scripture Index. Throughout Putting Jesus in His Place, the authors engage often in biblical exegesis, thereafter making known the theological implications of the bible's teaching regarding the identity of the Son of God. So too, arguments to the contrary are considered and dealt with carefully and biblically. As I read this book I found myself often pouring through the prolific amount of endnotes, finding enlightenment in the copious commentary and citations of everyone from James D. G. Dunn and Greg Stafford to F. F. Bruce and Daniel Wallace. Those endnotes function in two ways: 1) they serve as a valuable source of information for the reader, and 2) they serve to impart a constant annoyance to the reader who must place his thumb in the corresponding page so as not to loose his spot. Needless to say, I am praying that Kregal releases the second edition with footnotes. It is not so much the subjects covered that makes this book so terribly good, it is rather how things are approached and articulated. The authors have a way of engaging the reader that makes you feel genuinely involved in what is nothing less than a world-class treatment on the doctrine of the deity of Christ. This is a book you won't want to put down, and nearly six years later, I still find myself grabbing it off my bookshelf regularly. 1. Bowman and Komoszewski, Putting Jesus in His Place, 23.